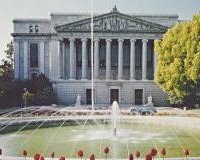 Sacramento—The Court of Appeal, Third Appellate District, will return to the historic Stanley Mosk Library and Courts Building, at 914 Capitol Mall, in Sacramento, on Monday, April 8, 2013, marking the completion of the renovation project that began in 2009. The Clerk’s Office will continue to operate from 8:30 a.m. to 4:30 p.m. at 621 Capitol Mall, 10th Floor, through Friday, April 5, 2013. The Clerk’s Office at 914 Capitol Mall will open at 8:30 a.m. on Monday, April 8, 2013. All telephone numbers will remain the same, and there should be no disruption to filings or to court operations during normal business hours. The Budget Act of 2005–2006 appropriated building construction funds for renovation of the Stanley Mosk Library and Courts Building. The project included fire, life, safety and infrastructure improvements and rehabilitation of the historically significant architectural elements of the circa 1928 building. The project required the Court of Appeal and the State Library to vacate the building so the renovation could be completed in a safe and timely manner. For more information about the move, contact Ms. Deena C. Fawcett, Clerk/Administrator, Third Appellate District, 916-654-0209.